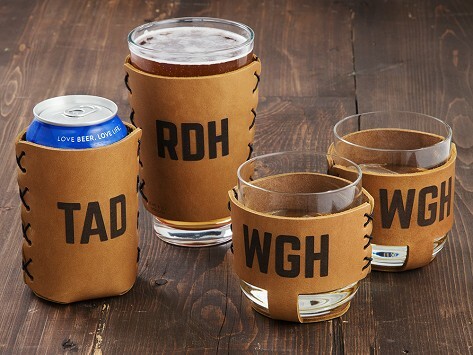 Slide on a custom leather koozie to keep a pint, a can of beer, or a glass of whiskey cool and hands drip-free in the best looking (and well-made) way possible. Recycled leather from boot and lace industries is hand-sewn and branded with a personalization that will never rub off or fade. Pint sleeve includes a glass, and whiskey sleeve set includes a pair of rocks glasses. Made in North Carolina and guaranteed for a lifetime. Dimensions: Leather Can Sleeve: 4.5" x 5.25" x 0.5"; Leather Pint Glass Sleeve: 5.5" x 4.25" x 0.25"; Leather Whiskey Glass Set of 2: 7.625" x 4.5" x 3.75"
Weight: Leather Can Sleeve: 0.16 lb. ; Leather Pint Glass Sleeve: 0.13 lb. ; Leather Whiskey Glass Set of 2: 1.75 lbs.